OLPC is yet to finalize the design for the OLPC XO-3 tablet and is looking for partners for production, as was disclosed by OLPC's founder and chairman, Nicholas Negroponte. The XO-3 tablet was last displayed at the International Consumer Electronics Show (CES) in January. Intended to be developed under the non-profit One Laptop Per Child (OLPC) initiative, the XO 3.0 tablets were set to be shipped at a price below $100 earlier this year, but that has been delayed. According to PCWorld, OLPC is yet to finalize the design and is looking for partners for production, as was disclosed by OLPC's founder and chairman, Nicholas Negroponte. Negroponte also said that OLPC is going through negotiations with a handful of parties regarding the manufacturing of XO 3.0 tablets and any suggestions about the production being stopped is completely untrue. Since its first introduction back in 2009, the XO 3.0 tablet has seen some changes in its design. At first, the design used a plastic flexible display, but degradation due to sun's UV rays and the plastic's easily scratched surface forced to switch and opt for glass instead. The 8 inch XO-3 is the first tablet from OLPC and will be offered as an educational tool to children from developing nations. With a goal to provide computing devices as a mean for learning, OLPC's earlier efforts has seen the XO-1 and XO-1.75 laptops being handed over to 2.4 million children and teachers worldwide. The XO-3 tablet features an 8 inch, 1024 x 768p display and comes with an 800MHz Marvell Armada PXA618 processor along with 512MB of RAM. It also offers 4GB of internal storage which can be expanded up-to 16GB, a front facing camera and an optional rear camera. Also, there’s a USB port, micro USB and a 3.5mm headphone jack. The tablet's battery offers between 8 to 10 hours of usage and weighs around 600g. The tablet is customizable with options for either a standard LCD or a Pixel Qi display. Some last minute changes have added a magnetic power cord. 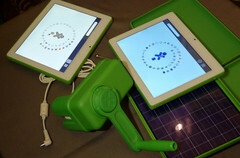 The OLPC XO-3 tablet is being developed to run on Linux-based OSes like the Sugar OS, Android or Chrome, but no Windows RT. Although the XO-3 is far from comparisons to an iPad or a Galaxy Tab, it still offers some innovative features such as charging through solar panels or hand cranks which is going to be useful where electricity is limited.